While it’s no longer called Nathaniel Hawthorne School Number 50, it still serves students today. Now the Providence Cristo Rey High School, the school has been through a few changes through the years. 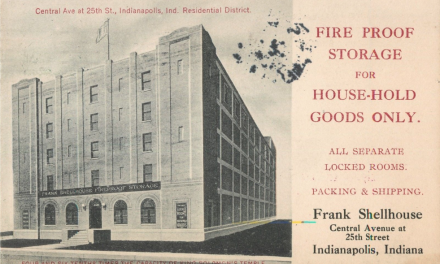 At the corner of Germania and Ohio Streets. Sometimes history’s mysteries aren’t so quick to yield their secrets, and this one is no exception. 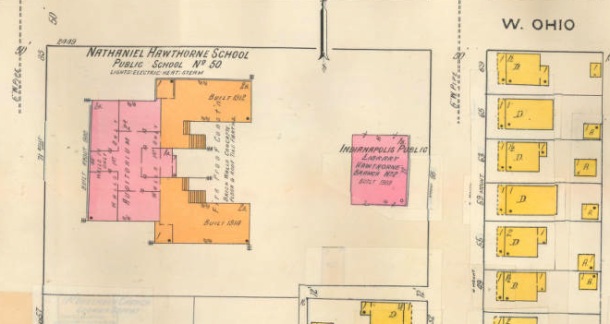 While an announcement was made on Hawthorne’s birthday anniversary, July 4, 1904, that School Number 50 would be named in honor of the famous author, and that building was in progress, the 1898 Sanborn map (above) shows a footprint with the school’s name. Was it a prescient mapmaker or a later edit? Can’t say. 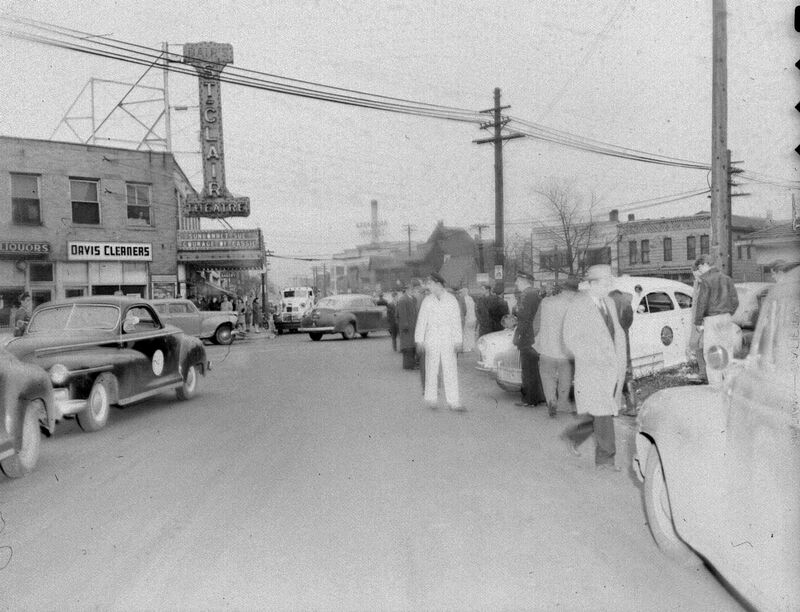 This building still stands and is part of the Hawthorne Neighborhood, a well-covered topic in an earlier HI article by Sharon Butsch Freeland. 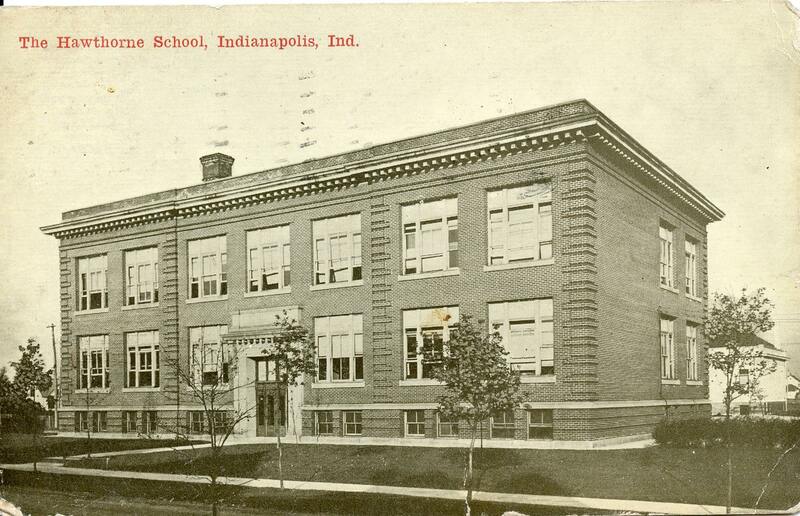 Art was frequently integrated into local schools in the early part of the last century, and many well known Indiana artists donated or worked to help decorate the teaching institutions. 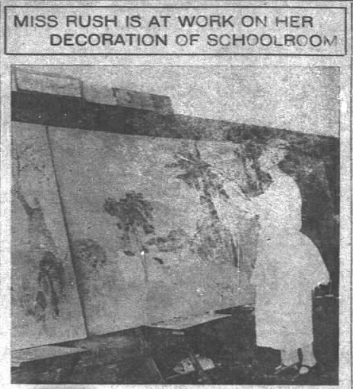 Local female artist, Olive Rush was hired to create a “decorations,” as they were called then, for this school in 1921. We wonder if those have survived through time or have been lost to a renovation? Rush created two artistic themes in colors suggestive of a fairyland: gray greens, green blues and gold tones that matched well with the interior wall colors. The central panel illustrated the Nathaniel Hawthorne fairy story of “Daffy Down Dilly” –a tale of a little boy who runs away from school and school master, intercepted by a character who turned out to be the school master himself, the boy returns to school. The other panel, based on a few well known childhood characters: The House that Jack Built, Little Bo Peep among flowers, Peter Rabbit, and the Ugly Duckling who became a beautiful swan, and other dreamy scenery appealing to children. 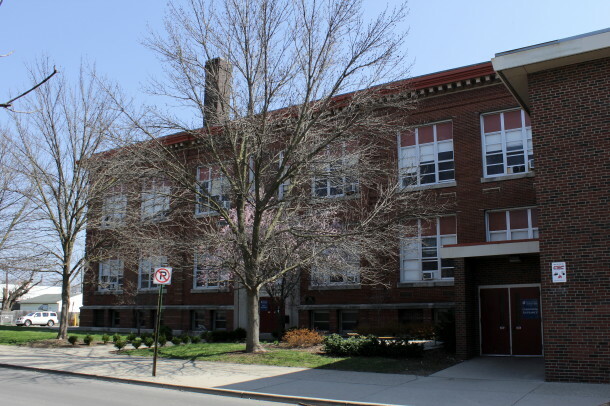 I found some information on this building while researching its near-twin, the Lucretia Mott School No. 3 (1905) on Rural Street. Nathaniel Hawthorne School No. 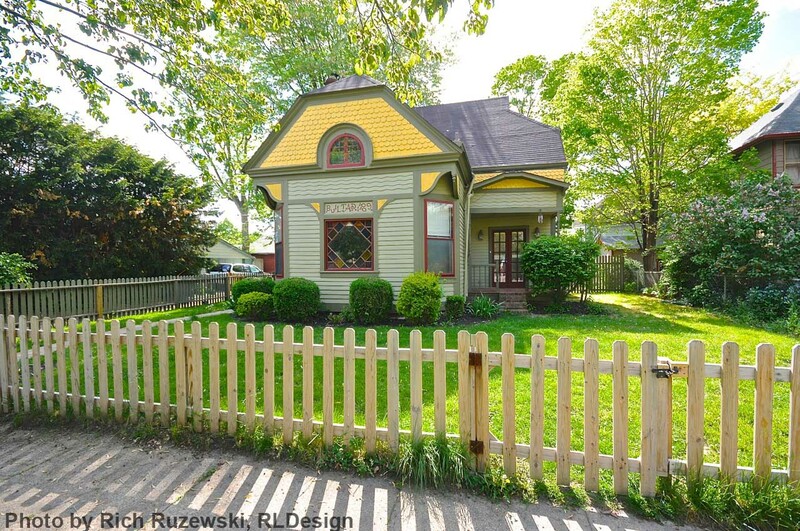 50 was built in 1904 following a design by Indianapolis architect Clarence Martindale. Warren & Wise were the general contractors. 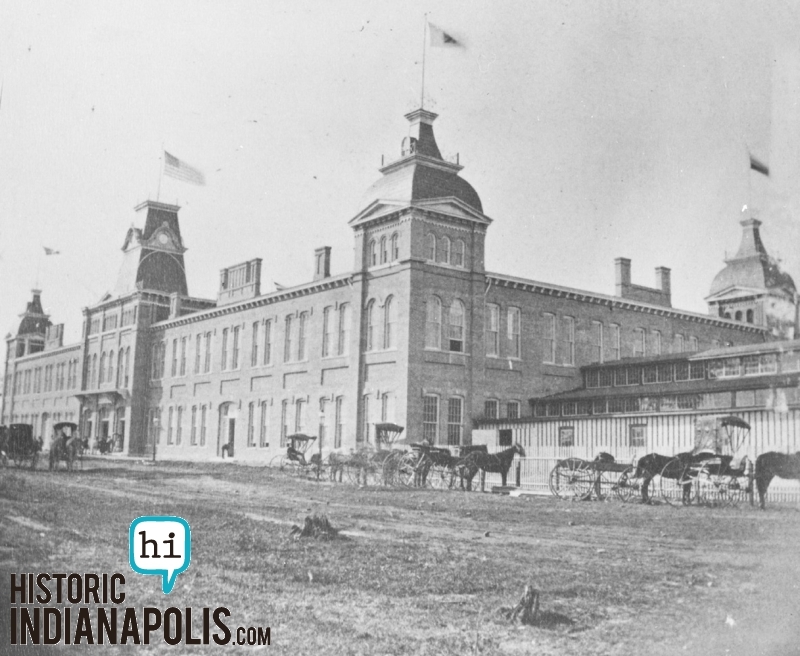 The site was purchased by the school board in 1903 as a part of a plan to replace the school in the former unincorporated suburb of Mount Jackson, annexed in 1897. Early articles about the construction refer to it as the “Mount Jackson School.” The project bid in May 1904, so it was probably under construction when the Hawthorne name was announced that July. 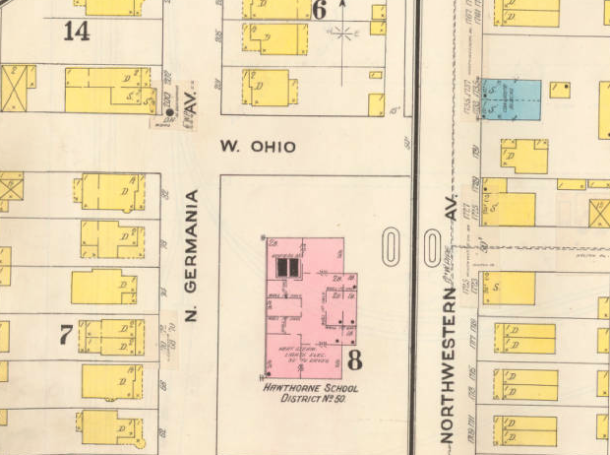 Sheet 113 of the 1898-1913 Sanborn Map was added during an update in October 1909 that showed the development in the Mount Jackson/Hawthorne area over the past 11 years. Is there any record of hauntings or paranormal activity in this building?